Entries tagged with “Olive Oil”. We saw it as a sin to waste excess frosting. Never bound to follow a strict recipe, my mom and I would mix and taste, mix and taste until we had a bowl of smooth, hearty buttercream frosting for whatever cake or brownie begged to be dressed. There’s nothing wrong with following a recipe – and I regularly do with tinted frosting to be sure I avoid having to make more that would risk being a different color – but the ad hoc way is much more fun. It almost always means leftovers, the best kind. I remember one afternoon during my senior year of high school. I came across a bowl of leftover frosting on the kitchen counter as I made my daily post-school forage through the kitchen. It was chocolate buttercream. Whatever baked good had been its original target was gone – all that remained was this bowl of excess joy. I hastily grabbed a teaspoon and dove in for one, good bite. Then another. And another. My indulgent solitude splintered when my mom came upstairs to find her piggy daughter shoveling frosting into her mouth. “Bria!” she hissed, and there was a pregnant pause while she marched into the kitchen, during which time I was sure she was about to scold me for wolfing down frosting straight from the bowl. “Use a big spoon.” She pulled two dinner spoons out of the silverware drawer and joined me as we savored the excesses of our prior handiwork. So it would be accurate to say I have a sweet tooth. And that I come by it honestly. I do not understand people who say they “don’t like sweets.” When I hear that, I feel as bewildered as I would if someone were telling me “I don’t really like having arms.” Still, as my advancing years teeter on the brink of 30, I find myself acquiring new-found patience for accommodating such bizarre tendencies (though I will draw the line at cutting anyone else’s meat so they don’t have to be bothered with the imposition of their northern appendages). My arsenal of demi-sweet desserts is growing, and I can begrudgingly admit I enjoy them, too. 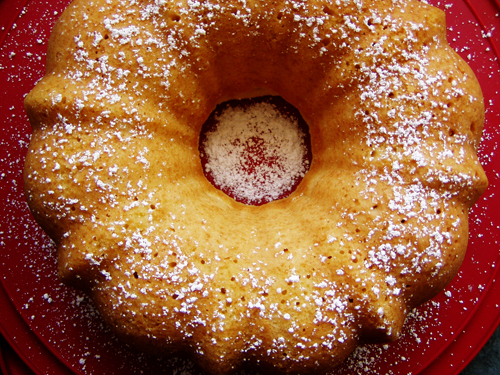 This olive oil cake mediates handsomely between the sweet-loving and the sweet-tolerating factions. Mildly sweet, it allows the nutty pizzazz of the olive oil to lilt upon the palette in a sly, flirty dance. The original recipe calls for Grand Marnier, which I have replaced with drambuie and almond extract. Despite many attempts to otherwise align my palate, I do not care much for citrus liqueurs. If you feel differently, substitute 3 tablespoons of Grand Marnier for the other liqueurs. Use the best, brightest-tasting olive oil you can justify. I serve this with a simple dusting of powdered sugar, but it would also be lovely with a berry coulis or a sugary glaze. If you go that route and end up with extra glaze for snacking, be sure to use a big spoon. The Salty Spoon is powered by	WordPress 2.7 and delivered to you in 0.171 seconds using 23 queries.